In the early 70′s, when the use of Fiberglass piping was rapidly expanding in process industries, premature failures nearly ended the fledgling market. 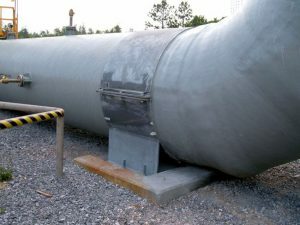 Frank Britt, a mechanical engineer with broad experience in pipe stress analysis, assisted a major resin producer and FRP pipe manufacturer to develop the first design procedures and a complete family of pipe supports for FRP pipe. FRP piping failures were virtually eliminated and the full service life of FRP pipe could finally be achieved. This focus on stress analysis allows our supports to perform excellently with Steel & HDPE piping. Support quality that complements the long service life of FRP pipe, and steel pipe. Rubber lined to prevent chafingExpanding the size range to accommodate large diameter pipe and ducts up to 35 feet.